Jordanian Arabic is a continuum of mutually intelligible varieties of Levantine Arabic spoken by the population of the Kingdom of Jordan. Jordanian Arabic varieties are Semitic. They are spoken by more than 6 million people, and understood throughout the Levant and, to various extents, in other Arabic-speaking regions. As in all Arab countries, language use in Jordan is characterized by diglossia; Modern Standard Arabic is the official language used in most written documents and the media, while daily conversation is conducted in the local colloquial varieties. Aside from the various dialects, one must also deal with the differences in addressing males, females, and groups; plurals and verb conjugations are highly irregular and difficult to determine from their root letters; and there are several sounds in Arabic that are difficult for an English speaker to pronounce. Although there is a common Jordanian dialect mutually understood by most Jordanians, the daily language spoken throughout the country varies significantly through regions. These variants impact altogether pronunciation, grammar, and vocabulary. Hybrid variety (Modern Jordanian): It is the most current spoken language among Jordanians. This variety was born after the designation of Amman as capital of the Jordanian kingdom early in the 20th century. It is the result of the merger of the language of populations who moved from northern Jordan, southern Jordan and later from Palestine. For this reason, it mixes features of the Arabic varieties spoken by these populations. The emergence of the language occurred under the strong influence of the northern Jordanian dialect. As in many countries English is used to substitute many technical words, even though these words have Arabic counterparts in modern standard Arabic. Northern varieties: Mostly spoken in the area from Amman to Irbid in the far north. As in all sedentary areas, local variations are many. The pronunciation has /q/ pronounced [g] and /k/ mostly ([tʃ]). This dialect is part of the southern dialect of the Levantine Arabic language. Southern/Moab: Spoken in the area south of Amman, in cities such as Karak, Tafilah, Ma'an, Shoubak and their countrysides, it is replete with city-to-city and village-to-village differences. In this dialect, the pronunciation of the final vowel (æ~a~ə) commonly written with tāʾ marbūtah (ة) is raised to [e]. For example, Maktaba (Fuṣḥa) becomes Maktabe (Moab), Maktabeh (North) and Mektaba (Bedawi). Named after the ancient Moab kingdom that was located in southern Jordan, this dialect belongs to the outer southern dialect of the Levantine Arabic language. Bedouin: Is spoken by Bedouins mostly in the desert east of the Jordanian mountains and high plateau, and belongs to the Bedawi Arabic. This dialect is not widely used in other regions. It is often considered as truer to the Arabic language, but this is a subjective view that shows no linguistic evidence. Note that non-Bedouin is also spoken in some of the towns and villages in the Badia region east of Jordan's mountain heights plateau, such as Al-Azraq oasis. The following sections focus on modern Jordanian. One syllable of every Jordanian word has more stress than the other syllables of that word. Some meaning is communicated in Jordanian by the location of the stress or the tone of the vowel. This is much truer than in other Western languages in the sense that changing the stress position changes the meaning (e.g. ['katabu] means they wrote while [katabu'] means they wrote it). This means one has to listen and pronounce the stress carefully. There are some phonemes of the Jordanian language that are easily pronounced by English speakers; others are completely foreign to English, making these sounds difficult to pronounce. b [b] As English ⟨b⟩. t [t] As English ⟨t⟩ in still (without the English aspiration). ṯ [θ] As English ⟨th⟩ in thief. It is rare, mostly in words borrowed from MSA. j [dʒ] As English ⟨j⟩, jam or ⟨s⟩ in vision (depending on accent and individual speaker's preference). ḥ [ħ] Somewhat like English ⟨h⟩, but deeper in the throat. ẖ [x] As German ⟨ch⟩ in Bach. d [d] As English ⟨d⟩. ḏ [ð] As English ⟨th⟩ in this. It is rare, mostly in words borrowed from MSA. ṛ [ɾˤ] Simultaneous pronunciation of ⟨r⟩ and a weak ayn below. r [ɾ] As is Scottish, Italian or Spanish. z [z] As English ⟨z⟩. s [s] As English ⟨s⟩. š [ʃ] As English ⟨sh⟩. ṣ [sˤ] Simultaneous pronunciation of ⟨s⟩ and a weak ayn below. ḍ [dˤ] Simultaneous pronunciation of ⟨d⟩ and a weak ayn below. ṭ [tˤ] Simultaneous pronunciation of unaspirated ⟨t⟩ and a weak ayn below. ẓ [zˤ] Simultaneous pronunciation of ⟨z⟩ and a weak ayn below. ʿ [ʕ] This is the ayn. It is pronounced as ḥ but with vibrating larynx. ġ [ɣ] As in ⟨g⟩ of Spanish pagar. f [f] As English ⟨f⟩. q [q] Similar to English ⟨k⟩, but pronounced further back in the mouth, at the uvula. It is rare, mostly in words borrowed from MSA apart from the dialect of Ma'daba or that of the Hauran Druzes. k [k] As English ⟨k⟩ in skill (without the English aspiration). m [m] As English ⟨m⟩. n [n] As English ⟨n⟩. h [h] As English ⟨h⟩. w [w] As English ⟨w⟩. y [j] As English ⟨y⟩ in yellow. a [a] or [ɑ] As English hut or hot (the latter linked to the presence of ṣ, ḍ, ṭ, ẓ, ẖ, ʿ, ḥ or ṛ). ā [a:] or [ɑ:] The previous one but longer (you hear [ɑ:] in father). Amman is [ʕɑm'ma:n]. i [i] As in English hit. ī [i:] As in English heat. u [u] As in English put. ū [u:] As in English fool. ē [e:] As in English pear, or slightly more closed. o [o] As in French côté. ō [o:] As French (faune) or German (Sohn). Note : It is tempting to consider /e/ and /i/ as variants of the same phoneme /i/, as well as /o/ and /u/. For the case of e/i, one can oppose 'ente' (you, masculine singular) to 'enti' (you, feminine singular), which makes the difference relevant at least at the end of words. The grammar in Jordanian is quite the mixture. Much like Hebrew and Arabic, Jordanian is a Semitic language at heart, altered by the many influences that developed over the years. A modified "el" used in words that start with a consonant produced by the blade of the tongue (t, ṭ, d, ḍ, r, z, ẓ, ž, s, ṣ, š, n. Sometimes [l] and [j] as well depending on the dialect). This causes a doubling of the consonant. Because of Arabic phonology, the definite article can be also elided onto the preceding word on the condition that it ends with a vowel and the word following the article starts with a constant that doesn't require an e()-, it is elided into an 'l and affixed to the end of the word. For example: Lámma'l kompyütar bıştağel means when the computer works. Note: The Modern dialect is understood by almost everyone in the country and the entire region. Similar to ancient and modern semitic languages, Jordanian adds a suffix to a word to indicate possession. In a sentence, the pronouns change into prefixes to adjust to the verb, its time and its actor. In present perfect and participle with a verb that starts with a consonant Ana becomes ba, Inta becomes 'Bt', Inti becomes Bıt and so-on. 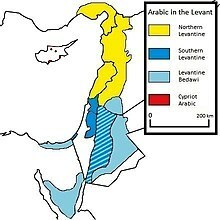 The Jordanian Levantine is not regarded as the official language even though has diverged significantly from Classic Arabic and Modern Standard Arabic (MSA), or even the colloquial MSA. A large number of Jordanians, however, will call their language "Arabic" while they will refer to the original Arabic language as Fusħa. This is common in many countries that speak languages or dialects derived from Arabic and can prove to be quite confusing. The writing system varies; whenever a book is published, it is usually published in English, French, or in MSA and not in Levantine. There are many ways of representing Levantine Arabic in writing. The most common is the scholastic Jordanian Latin alphabet (JLA) system which uses many accents to distinguish between the sounds (this system is used within this article). Other Levantine countries, however, use their own alphabets and transliterations, making cross-border communication inconvenient. Modern Standard Arabic (MSA) is spoken in formal TV programs, and in Modern Standard Arabic classes, as well as to quote poetry and historical phrases. It is also the language used to write and read in formal situations if English is not being used. However, MSA is not spoken during regular conversations. MSA is taught in most schools and a large number of Jordanian citizens are proficient in reading and writing formal Arabic. However, foreigners residing in Jordan who learn the Levantine language generally find it difficult to comprehend formal MSA, particularly if they did not attend a school that teaches it. Other influences include English, French, Turkish, and Persian. Many loan words from these languages can be found in the Jordanian dialects, particularly English. However, students also have the option of learning French in schools. Currently, there is a small society of French speakers called Francophone and it is quite notable in the country. The language is also spoken by people who are interested in the cultural and commercial features of France. ^ "Jordan". Ethnologue. Retrieved 8 August 2018. ^ Hammarström, Harald; Forkel, Robert; Haspelmath, Martin, eds. (2017). "Eastern Egyptian Bedawi Arabic". Glottolog 3.0. Jena, Germany: Max Planck Institute for the Science of Human History. ^ a b Jordanian Arabic phrasebook – iGuide Archived 6 October 2011 at the Wayback Machine. Iguide.travel. Retrieved on 19 October 2011. ^ a b Ethnologue report for language code: ajp. Ethnologue.com. Retrieved on 19 October 2011. ^ a b iTunes – Podcasts – Jordanian Arabic Language Lessons by Peace Corps Archived 21 August 2010 at the Wayback Machine. Itunes.apple.com (16 February 2007). Retrieved on 19 October 2011. ^ Syria – Diana Darke – Google Books. Books.google.com. Retrieved on 19 October 2011.